This editable document is included in Proposal Kit Professional. Order and download for $199. Follow these steps to get started. The Maintenance Tips document includes some sample checklists of things to be aware of when changing an existing site. Use these checklists to add your own maintenance steps specific to your projects. I installed it I recouped the value immediately. The security of having the system walk me through the process was worth many times the price. I have used this in a number of businesses from a handyman service to software sales and a logistics service and each time it has served me well." 1. Get Proposal Kit Professional that includes this business document. This Project Maintenance Tips is included in an editable format that can be customized for your own needs. Once you have ordered and downloaded your Proposal Kit Professional you will have all the content you need to get started with your project management. 3. Customize the project template with your own information. You can customize the project document as much as you need. You can also use the included Wizard software to automate merging in name/address data. The following are checklists to follow when modifying a project. Use these checklists as a starting point and modify them as needed for your own projects. These checklists are used to ensure your projects remain consistent, unbroken and user friendly as they are changed over time. Start with appropriate index or content page as a template to ensure page is consistent in layout and design with other pages. Add content to middle table abiding by design guidelines, keeping the sites header and trailer navigation consistent. Update keyword list library for search engines and meta tags. Update page description meta tag. Update page title meta tag. Update revision date. Modify index and content pages to link the new page (see modifying below). Update site map. Run spell checker. If needed copy text into word processor for grammar checking. Upload all related page changes, graphics and components. Test page modifications (see below). Consider using a tool such as link consistency checker to recheck all of the sites links. Add page to WebPosition or Search Engine Commando Pro submission process to be submitted to search engines (or add to robots.txt file if new pages is not to be spidered). If a form or script was added test all functions and all possible combinations of inputs. Check out the page to be modified if using a source code control system (i.e. don’t modify a page if someone else has control over it, otherwise changes may be overwritten and lost). Make modifications abiding by established design guidelines to keep the design consistent. Update the home page new section for important additions. Run spell checker and/or grammar checker. Update revision date. Upload all related page changes, graphics and components. Test page modifications (see below). If adding a form or script test all new and existing functionality. Web pages should never be deleted. Change them to redirect to another page. They may be bookmarked or indexed by external sites. If you do delete pages your web server should be configured to display a custom error page that is integrated with the sites look and feel. Intranet pages may be deleted. Notify web master, as links may be broken. Upload all related page changes, graphics and components. Test page modifications (see below). Test site with a link consistency checker to check for broken links after removing page from server. Test with latest versions of appropriate browsers. Test all plug-ins and applets. Test all forms and scripts. Test site with a link consistency checker to check for broken links and other potential problems. 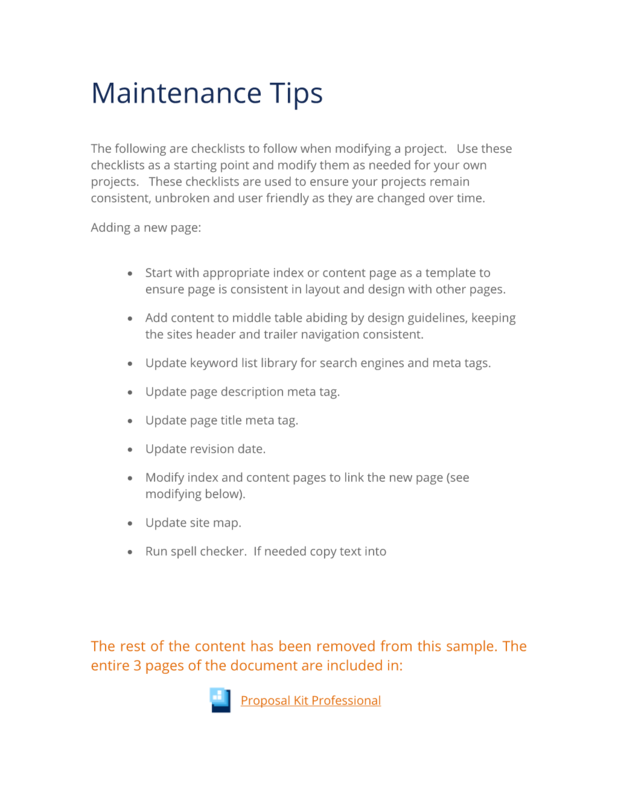 The editable Project Maintenance Tips document - complete with the actual formatting and layout is available in the retail Proposal Kit Professional. The Project Management Pack suite of templates compliments the proposal and contract documents by giving you a collection of business documents to be used once you have a project to work on.